It isn’t just because of my affinity with the names of the artists that I go for Morning Noon I Cry. There’s the meandering solo trumpet, and the mournful chord structure for example. There’s also some fine harmony vocals from the Sisters but the main delight is writer Roger Ridley’s superbly heartfelt lead. He is passionate and gritty, and when he cuts loose after a preaching rap he really shows his class. The label doesn’t give a clue as to the record’s origins but the time of the recording must be the 60s. The other certainty is that the group came from the church – anybody any idea where in the US? UPDATE ~ Following the publication of this webpage the indefatigable Greg Burgess has been in contact with members of the Ridley family and discovered substantial new info about this talented family. He writes "Roger Ridley and the Ridley Sisters were from Charles Junction near Lumpkin, Georgia. 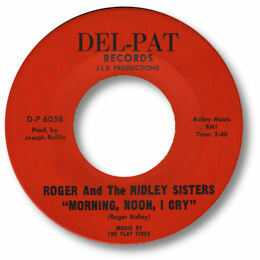 At the time of the Del -Pat recording the Ridley Sisters consisted of Julia Van Matre (nee Ridley), Dorothy Pitman Hughes (nee Ridley) and Mary Cunningham. They came from a solid Church background and this was a rare incursion into the secular world of recording. Dorothy Pitman Hughes later recorded a number of blues sides as Jean Myers. She is a well known Civil Rights Activist and feminist polemicist (you can purchase her extraordinary book here). 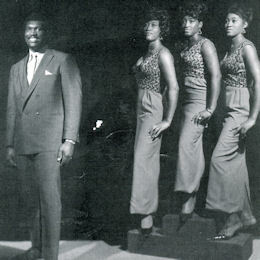 Roger Ridley moved to New York around 1970 where in recent years he could be found playing to tourists and commuters on the Subway. In 1998 he was featured on the CD Subplay - a compilation of Subway Musicians of New York performing 'Subway Station'. His sister Alice Tan Ridley is also featured. He also recorded a CD of voice and guitar covers of soul songs that is available here". I have also been incontact with Lakisha Ridley - Roger's daughter. I'm very grateful to Greg for the research and to the Ridley family not just for their wonderful 45 but their interest as well. FURTHER UPDATE ~ Tony has written with the news that "Roger Ridley is featured on the Playing for Change website. The rendition of "Stand by Me" is incredible. He passed in 2005."